Delia Razon, Caridad Sanchez, Perla Bautista, Gloria Sevilla (who came with her daughter Suzette Ranillo), Lilia Dizon, Marita Zobel, Minda Morena, Charlie Davao, Pepito and Ramil Rodriguez, Robert Campos and Eddie Garcia, who even obliged to rendering his version of “Dandansoy”, accompanied by the CCP Rondalla. The well loved Anita Linda graced the occasion as well, and took the time to thank Doc Romy in public for his portrayal of their lives in print. Myrna Obligacion, wife of the Oscar Obligacion, as well as Digna Bonnin, wife of Bernard Bonnin took the time to join the celebration in memory of their husbands. 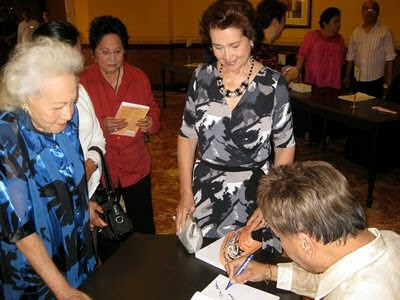 Tito Romy autographs "Balik Tanaw" for actresses Anita Linda, Gloria Sevillia and Marita Zobel. 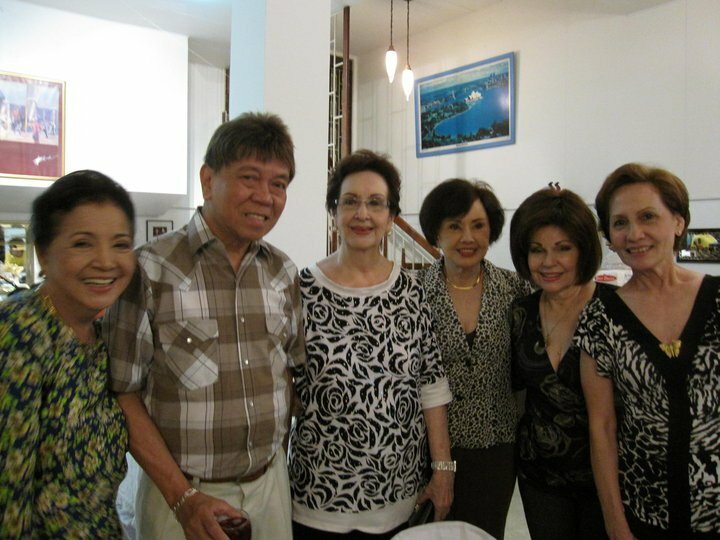 Movie legends Gloria Romero, Susan Roces, Amalia Fuentes and Boots Anson Roa were not able to attend the book launch but shared with the other stars an evening of dining, singing and reminiscing at Ms. Pilita Corrales’ home the night after, who herself sang special Tagalog and Visayan kundimans during the book launch. Pempe Rodrigo (daughter of Soc Rodrigo and coordinator of the movie actors’ organization, Baliksamahan) who has also been instrumental in getting the movie actors together was pleased to see the fruits of her efforts, as well. Highlights of the afternoon included the top class renditions of contemporary Tagalog love songs by the UP Concert Chorus. Many of the song renditions by UPCC brought back memories and tears to the audience as they sang some well loved movie themes. 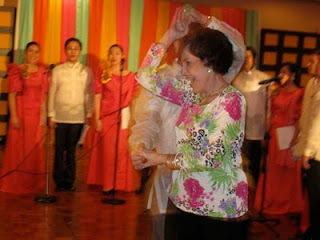 Doc Romy was even moved to his feet by one of their music pieces and danced with Perla Bautista and Delia Razon. Later, the internationally acclaimed ballroom dancer Edna Ledesma, with her partner Miguel dela Serna, displayed her grace on the dance floor, moving with almost a feather-like lightness, which held everyone in awe. The afternoon’s hosts Arnel Ignacio and book editor, Carmel Beltran kept the affair vibrant and entertaining for everyone. Towards the end of the afternoon, Arnel interviewed the actors and actresses who were just as happy to share some of their unforgettable anecdotes during their days of fame. 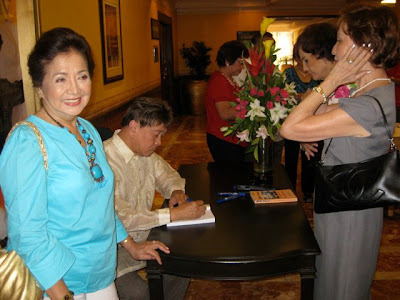 It was unfortunate that I was unable to attend the book launch, so when the author, Tito Romy Protacio sent me the photos above, I took the opportunity to ask him a couple of questions, like a short interview. It was a rare chance to ask him about his thoughts and feelings about the book and the Philippine Cinema in general. Reyjr: How do you feel now that your book has been launched? Any plans for another book in the future? 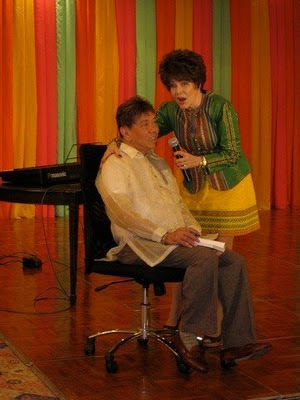 Tito Romy: "I’ve been encouraged by the remarks given by the movie stars during the book launching – Nakakataba ng Puso. I’ve started my Volume II today, June 28, 2010. I interviewed Lani Oteyza. She is based in Victorville, California." Reyjr: Wow! That's great, Tito. Looking forward to it. Now, your book immortalizes the actors and actresses of Philippine television and cinema, but what do you think of the current roster of artists as compared to the past? How are they similar and how are they different? Personally, I hope to see more quality films coming out, that are artistically made, unique and can be true representations of the Filipino talent. The life stories of movie stars can be an inspiration which I want to see immortalized in the pages of this book. I know that their legacy will live in the hearts of our future readers, including the younger generations of movie stars who will benefit a lot from following their footsteps. The new stars should always remember that fame is transient, and it is only their art that will sustain them. For this reason, they should love their art, the same way that most of our yesteryear stars have done. How to get a copy of the book "Balik Tanaw"
“Balik Tanaw: The Filipino Movie Stars of Yesteryears” is now available in all the National Book Store outlets nationwide. There will be another book signing on Saturday, November 6, 2010, from 3:30 p.m. to 6:00 p.m. at the National Book Store Super Branch in Cubao (beside Gatewall Mall). Thank you Tito Romy and to all who made this book and this event possible. I hope you continue to be an inspiration to the new breed of celebrities and movie stars today!